Sani-Baby Sanitary CPR Manikins by Simulaids: Finding a manikin, no matter whether it is an Adult, Child or Infant, that is inexpensive, sturdy and low maintenance, can be like finding a needle in a haystack. Do not look any farther! 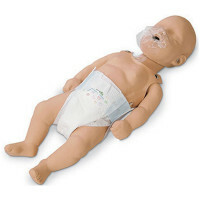 We have Simulaids Sani-Baby which is a baby-sized manikin that is economical and very low maintenance because the all lung/airway and face shield system parts are all disposable and sanitary. This means no more cleaning and sanitizing after each use and every student can start fresh! With the realistic features of the Sani-Baby such as defined ribcage and xiphoid process, you have the best of all worlds: Realistic, high quality and low maintenance! Sani-Baby Manikin and Accessories - Disposable, sanitary, realistic and no maintenance at all! Your source for Simulaids Sani-Baby CPR Manikin & 4 Pack, CPR Prompt®, Nasco, Lifeform, Simulaids, sani man, basic buddy, baby buddy, actar, laerdal, ambu, CPR packs, CPR Manikin face shields, CPR safety kits, CPR products and CPR supplies - CPR Manikins, CPR Mannequins, CPR Masks, CPR Products, CPR Supplies, CPR Training, CPR Videos, CPR Face shields, CPR Equipment, CPR kits, CPR Dummies, CPR Shields, CPR Barriers, CPR Mouth Barrier, CPR Pocket Masks, and all CPR Needs Also, the new source for new and refurbished inexpensive AED, Automated external defibrillators we carry Zoll AED Plus, Zoll AED Pro. Medtronic LifePak 500, Medtronic Lifepak CR Plus, Defibtech Lifeline AED, Heartsine Samaritan PAD, Heartsine Samaritan AED, and AED Trainers - Wholesale to the Public Manufacturer Direct Safety Product Sales since 1993 & First Aid Supplies... what ever your roadside emergency needs may be, we have the First Aid Supplies for you! - Wholesale to the Public Manufacturer Direct Safety Product Sales since 1993.